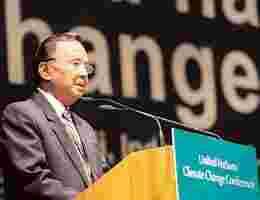 Bali: Australia won an ovation at the start of the United Nations (UN)-led climate change talks in Bali on Monday by agreeing to ratify the Kyoto Protocol, isolating the US as the only developed nation outside the global pact. Soon after an Australian delegate promised immediate action on Kyoto, new Australian Prime Minister Kevin Rudd took the oath of office and signed documents to ratify, ending his country’s long-held opposition to the global climate agreement. Relieved: Rachmat Witoelar, president of the 13th session of the Conference of the Parties, speaks at the opening session of the the UN Climate Change Conference 2007 on Monday. “I think I can speak for all present here by expressing a sigh of relief," conference host and Indonesian environment minister Rachmat Witoelar said. Nearly 190 nations are in Bali seeking a breakthrough for a new global pact to fight climate change by 2009 to avert droughts, heatwaves and rising seas, which would hit the poor the hardest. “The world is watching closely," Witoelar told delegates at the meeting, which started on Monday and ends on 14 December. The meet is hoping to bind outsiders led by the US and China into a long-term UN-led fight against global warming. “Climate change is unequivocal and accelerating," he said. “It is becoming increasingly evident that the most severe impacts of climate change will be felt by poor nrations." A new treaty is meant to widen the Kyoto Protocol, which obliges 36 industrial countries to cut greenhouse gas emissions by 5% below 1990 levels by 2008-12. The US and developing nations have no caps under Kyoto. The US, as the world’s top greenhouse gas emitter, has been feeling the heat from developing nations demanding the rich make stronger commitments to curb emissions. Australia, the world’s top coal exporter and among the world’s highest per- capita greenhouse gas polluters, has been criticized for years for refusing to ratify the global treaty. “It was an emotional and spontaneous reaction to a very significant decision to ratify the Kyoto Protocol," Yvo de Boer, head of the UN climate secretariat, said. The US was unfazed. “We respect Australia’s decision," Harlan Watson, head of the US delegation, said. “We’re not here to be a roadblock. We’re committed to a successful conclusion here." De Boer told delegates that rich nations had to agree to axe emissions from burning fossil fuels to encourage poor countries to start braking their own rising emissions. “Bold action in the North can fuel clean growth in the South," he said, urging a sharing of clean energy technologies, such as solar or wind power. “I fervently hope you will make a breakthrough here in Bali by adopting a negotiating agenda." Others urged caution. “At the opening ceremonies for the climate talks in Bali, there was lots of goodwill and optimism, but there is clearly a challenging road ahead," said Angela Anderson, vice-president for climate programmes at the Washington, DC-based National Environmental Trust. “Agreements on adaptation, deforestation and technology cooperation must be reached before the high-level officials arrive next week. While all the governments agree in principle, there is significant disagreement on the details." Climate change talks have been bogged down by arguments over who will pay the bill for cleaner technology and how to share out the burden of emissions curbs between the rich and poor nations. China and India, among the world’s top polluters and comprising more than a third of humanity, say it’s unfair and unrealistic for them to agree to targets, particularly as they try to lift millions of its people out of poverty.